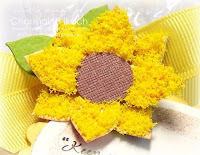 Charmaine - this is so beautiful and so sweet and packed with sunshine!!! I LOVE IT! What a great idea and brilliant use of flower soft!! Simply beautiful!!! Super cute, love that sunflower! I used that flower soft on a bee this last week, great job with the planter! Charmaine - this is such a fun idea and I'm sure whoever is the recipient of this ray of sunshine from your heart will cherish it always, you're so thoughtful!! So happy and sweet Charmaine!! Love your flower soft sunflower!! What an adorable little gift! LOVE the Flower Soft!!! Oh Chairmaine! This is a perfectly beautiful little gift! 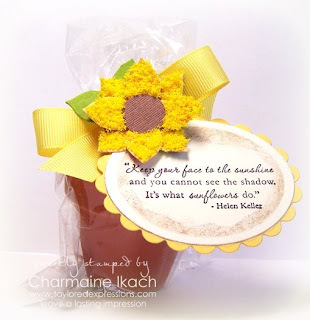 I love how the flower soft adds texture and life to the sunflower...great sentiment too! You are continually amazing me with your creativity! This would make a beautiful mothers day gift, really very nice work. What a gorgeous project! I need to try Flower Soft. Thanks for the inspiration! No WAY! Charmaine...as usual, this is PURE perfection!